The first time I heard F.X. Toole's story I thought: "If he could do that surely I can make my dreams come true." may have heard of the Oscar-winning movie Million-Dollar Baby, the film adaptation of short stories by Toole. In his mid-forties Boyd (Toole) decided to become a boxer. He had to take some years off from boxing shortly after that, but started seriously working with a trainer in his late forties. If the story stopped there it would be phenomenal. It's inspiring to think about a forty-eight or forty-nine-year old body adapting to the stress of boxing and to think about its owner having the mental fortitude to endure the pain and whip his reluctant body into shape. But then Boyd's heart revolted, according to his own account in the intro to Rope Burns. He had to have surgery but still managed to return to boxing training, although he couldn't put in as many hours training. This is where the lesson of Jerry Boyd kicks into high gear. It's a lesson about passion meeting vision. His aging body wasn't equipped to be a pro boxer, but he loved boxing. So he found another way to participate, as a corner man. He patched up fighters in the ring so they could continue to fight. Boyd's love of boxing may have never paid off financially, but it did pay off another way. It helped him to achieve another dream: to become a published author. After writing and submitting stories to publications for decades Boyd finally had his first book published when he was 70-years-old. He died two years later. 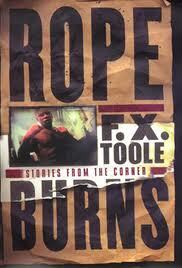 In the intro to Rope Burns Boyd said he had never made money from writing or boxing (up to that point). But I can imagine him waking each day before dawn to write, sometimes staring at a blank page not sure what to write, anticipating the thrill of sudden insight, the unexpected rush of words to the mind, his blood rushing, intoxicated by inspiration. That's something money can't buy, joie de vivre, the joy of living. There is a joy that accompanies the unbridled flow of creativity. I have felt it in predawn hours as I sat composing a melody at my keyboard. I've never really thought about it this way before, but the possibility of feeling that rush can be inspiration on those days when the allure of an extra hour of sleep entices us to stay in bed instead of creating. Honestly, Boyd's route to success is not the one I'd choose. I'd like to earn money doing what I love, and I'd like to live to see the fruits of my labor, but Boyd's story does illustrate a point. Sometimes doing what you love is its own reward. I've received that reward, and it's sweet. It's been a while, but I remember starting to write at night with music playing. At some point I stopped hearing the music. At some point time stood still, and the next sound I heard was the chirping of birds. It was after 4 a.m. My instincts had taken over. The writer within had leaped over my logical mind and flown on inspiration for hours. Those sweet moments of pure concentration are as peaceful as a night of uninterrupted slumber, and the revelations they bring can be life-changing. I guess the trick is to appreciate the gift of these moments, the gift of doing what you love and facing each new day with joy and expectation, even when you're not getting paid for it.